Keiko returns from some trip that sort of explains why she’s never around and tells O’Brien that she’s actually an alien who’s taken control of Keiko’s body. She gives O’Brien a bunch of stuff to do on the station and tells him if he informs anyone, she’ll kill Keiko. 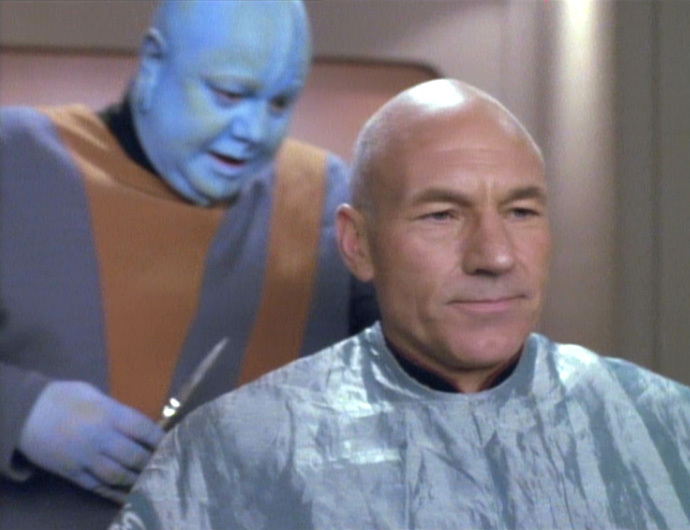 O’Brien gets everything done with the help of Quark’s dumb brother Rom (Max Grodenchik) and realizes the thing in Keiko is likely a pah-wraith, sort of the evil version of the prophets who live in the wormhole. Keiko’s plan seems to be to use the modified station to kill all the prophets. O’Brien leaves the station with Keiko in a runabout and then activates the modifications on the station and fires toward the wormhole. But the shot hits the runabout instead, killing the thing inside Keiko. Keiko is shaken, but OK. In what could have been a pretty forgettable episode, we meet the pah-wraiths, who play a major, major role down the stretch in DS9. We even learn that they’ve been hanging out (banished to, really) the fire caves on Bajor. Also of note is the continued evolution of one of the series’s worst characters, Rom. By this point, he’s still the moron he was early on, but he’s also a “engineering genius”. To the show’s credit, they establish this and then let it evolve to the point where Rom’s skills are key in the events surrounding the Federation’s defense of the station against the Dominion. Still, it’s too bad the creators did such a poor job of writing Rom the rest of the time. Rom, dumb in all things… except engineering?! I truly hate this episode. It’s just so full of nonsense. It’s the worst of the “O’Brien suffers” episodes that we saw about once a year throughout DS9’s run. Colm Meaney, as usual, makes something out of the material, but it’s still a bad episode. First of all, how would a pah-wraith banished to the fire caves for thousands of years have any idea how to modify the station’s systems? Granted, the creator knows what Keiko knows, but Keiko’s a freaking botanist! And given that she was surprised by O’Brien’s actions at the end, it’s not as if she was all-knowing. Beyond that, why did she need to be in a runabout near the wormhole in the first place? She could have stayed on the station and gotten a pretty good view of her plan coming to fruition and not exposed herself to O’Brien’s switcheroo. There’s no evidence that she needed to be near the wormhole — and she likely was trying to secure the thing for ALL the pah-wraiths and not just herself. So, really, the only reason for her to be on the runabout was so that O’Brien could have a way out. Then, there’s Rom. 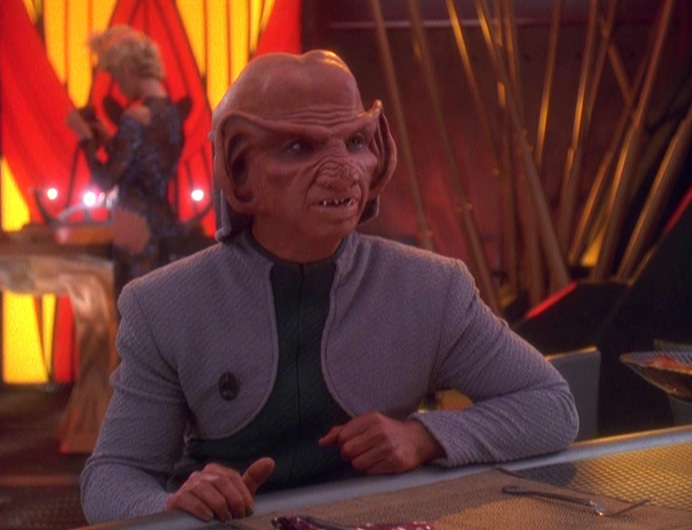 Now, it’s true that the Ferengi (Quark, Rom, Nog) can be good additions to episodes — whereas Ferengi-centric episodes are largely stupid if not pointless. But Rom’s actions here just are too hard to swallow. Basically, he’s able to ascertain what’s going on by looking at the tasks O’Brien has him complete — which MIGHT make up half of O’Brien’s assignment — and remembering the wormhole/prophets stuff Leeta (Rom’s Bajoran girlfriend) has told him. A lot’s made about Rom being super smart after DS9’s first couple years (in which he was just written as an idiot) but his assessment here is a freaking miracle. Of course, maybe this is further proof that Ferengi can absorb information more quickly than other races. Of course, if that’s true, it’s amazing that they’re such interstellar dunces. Rosalind Chao’s not a bad actor. But the performance and writing of Keiko throughout DS9 paints her as mostly a nag who complains a lot. Initially, her plot line involved her unhappiness on the station where a botanist had little to do — and that was somewhat passable. But the school stuff mostly went away after the first season and Keiko basically became the unhappy wife. It’s telling, then, that Keiko appeared just five times in DS9’s final three seasons, including in the final episode. With the Dominion war raging, there was a lot less for her to do — and, really, she and daughter Molly should have likely been away from the station while fighting was going on, anyway. This episode really gives Chao the most to do that isn’t relegated to her family, other than the school stuff. Chao isn’t bad in the role, but the episode is just so full of holes that her performance isn’t nearly enough to make it a better overall viewing. Odo’s a daddy! Sort of, maybe. 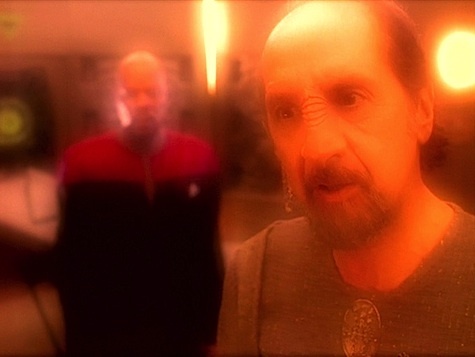 An old Bajoran ship emerges from the wormhole and its pilot is Akorem Laan (Richard Libertine, otherwise known as the editor on “Fletch”) a famous poet lost for two centuries. He’s convinced that he’s the Emissary as he found the wormhole and the prophets first. Sisko’s initially relieved, but Akorem starts messing things up by saying the Bajorans should revert to a strict caste system. Such a system would prevent Bajor from joining the Federation and prompts a crazy vedek to kill someone from an unclean sect. 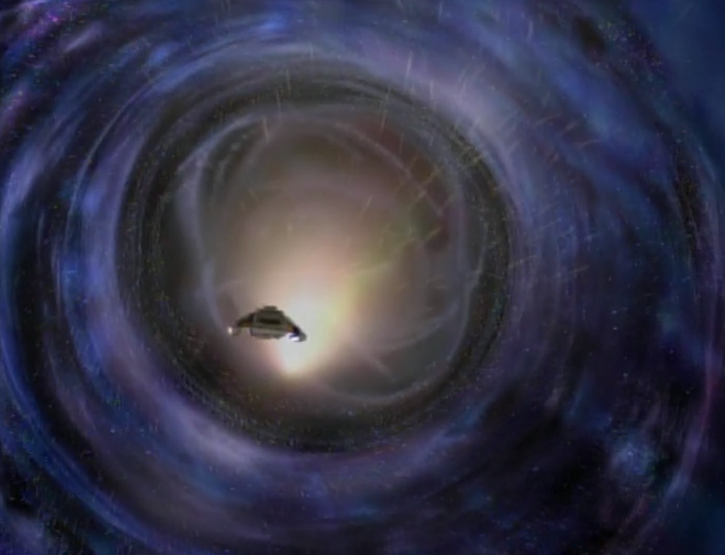 Sisko and Akorem go into the wormhole, and it turns out the whole endeavor was a sort of test for Sisko (seems like “The Matrix” creators watched this episode). Akorem is sent back to his own time, the caste system is abandoned and Sisko finally starts to embrace his role as Emissary. Much of the Bajoran stuff from DS9’s first couple seasons was forgotten by mid- to late-DS9. That’s too bad in some ways, as the trilogy to start season two was really good TV. But its lasting consequences were minimal as Bajor just sort of fell in line (other than our old buddy Kai Winn) as the series went on. But Sisko’s role as Emissary became increasingly important. Having him embrace it here was crucial for the character, as Sisko went from a career Starfleet officer — see his discussion with Worf at the end of “The Way of the Warrior” — to a person who embraced being a religious figure. For three-and-a-half seasons, this was a point of tension for Sisko. After “Accession”, Sisko not only takes the Emissary ball. He runs with it. Also of importance is the idea that the prophets are “of Bajor” a point first made here. What exactly this means is never explained, but the fact that the prophets have a stake in what happens in linear time is a very important factor in what we see later, particularly in the Dominion War. Yay! Keiko’s back. Let the bickering begin! Of course, the change in the prophets is rather abrupt. Back in “Emissary”, the prophets just sort of tolerated passage through the wormhole and didn’t get linear beings. 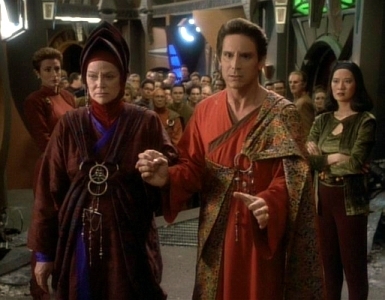 The Bajorans had built a religion around them, but it certainly appeared as if the prophets hadn’t done anything intentionally to stoke that — even if the orbs they sent were at the center of the Bajoran faith. Here, it’s pretty clear the prophets helped propagate the religion. Their earlier connection to Bajor isn’t explained — which is fine — but the break from what we saw in season one is abrupt. Now, we learn later that the prophets occasionally would change things after learning about them, so maybe after “Emissary”, they decided to up their game. But that doesn’t make sense for a species that knows no difference between now, the past and the future. Lastly, I’m surprised no Bajorans wondered whether Sisko did something untoward to Akorem. Remember that these are the same people who very quickly decided Sisko wasn’t the Emissary. Wouldn’t someone have asked some tough questions? Hell, it’s kind of amazing that Kai Winn — who is said to have sided with Akorem — didn’t pop up and fight Sisko. A lot of people don’t like the Bajoran DS9 stuff, but I think that had more to do with timing than anything. The Bajoran infighting happened while the series was really getting its sea legs. I think the issue isn’t that the Bajoran stuff was weaker material. I just think it mostly occurred when the actors and writers were fine-tuning their games. Avery Brooks, in particular, grew into the Sisko role as the series went on. 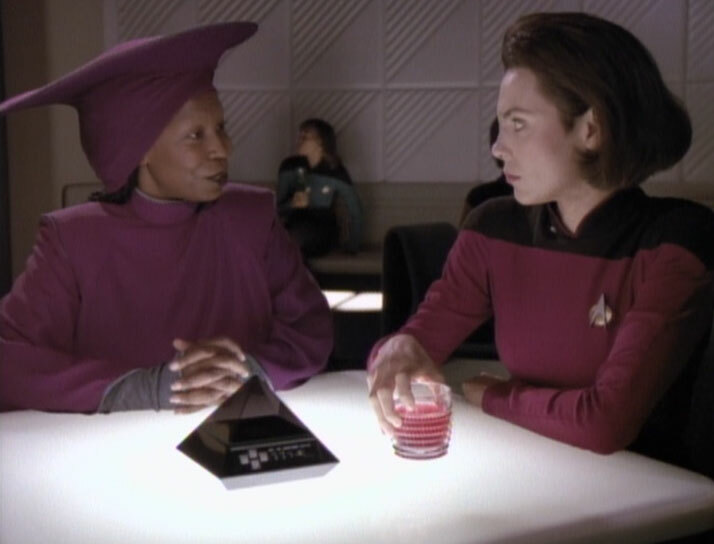 Heck, the scene here with Nana Visitor, in which Kira tells Sisko she plans to leave to follow her caste and become an artist, is one of the stronger character moments in the series — especially if you remember where the characters started when the series began. Now, maybe you could argue that DS9 as a series really took off when the stakes were greater — when the fate of the galaxy was in play, instead of the fate of one (relatively) insignificant planet. Of course, that’s one of DS9’s lasting legacies, that what was at first a rather inconsequential setting became so important in the greater Star Trek tapestry. This episode also has one of DS9’s best laugh-out-loud moments. 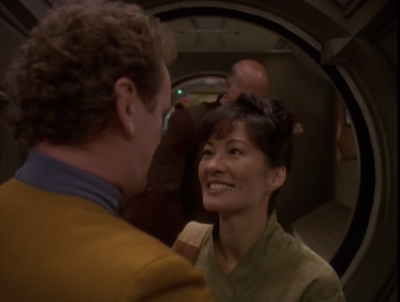 The subplot involves Keiko returning to the station and telling O’Brien she’s pregnant. The stuff with O’Brien and Bashir missing each other is nice (if a little forced) but Worf’s reaction to learning Keiko’s preggers — Worf, of course, delivered Molly O’Brien back on TNG — is priceless. A written summary doesn’t do it justice, so just go watch the episode. Is Sisko sleeping with the enemy? Seriously, that was in the old promo. 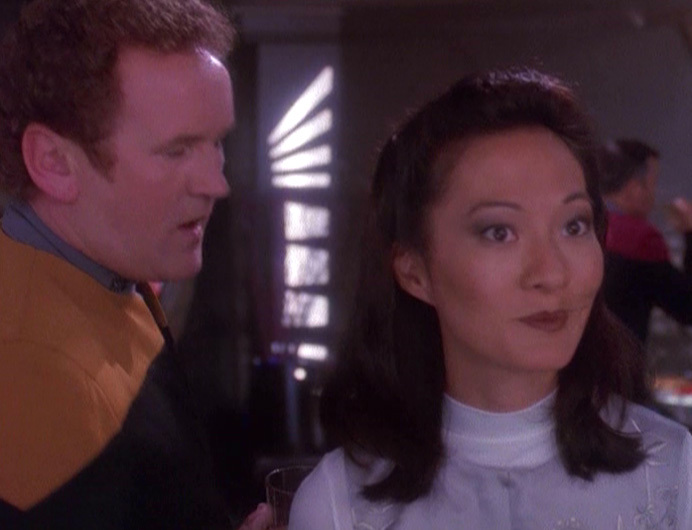 A dust up between the Federation and the Bajorans ensues when Keiko O’Brien (Rosalind Chao) starts teaching Bajoran children at the station’s school that the wormhole is not (explicitly) the Bajorans’ celestial temple. Orthodox Vedek Winn (Louise Fletcher) shows up and starts making noise in her bid to become the next kai, after the previous one’s death earlier in season one. Her chief rival Vedek Bareil (Philip Anglim) comes to the station to help mediate, and Winn gets O’Brien’s Bajoran assistant, Neela (Robin Christopher) to make an attempt on Bareil’s life. 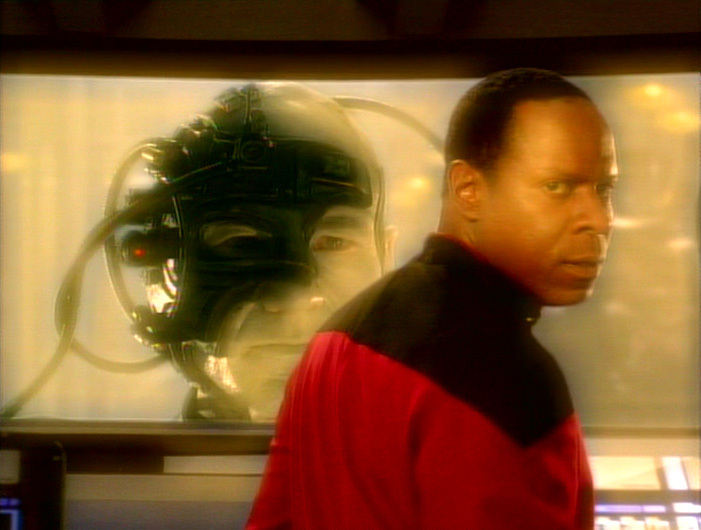 O’Brien figures out what’s happening in time to alert Sisko, who stops Neela. Kira, who had supported Winn, confronts her, accusing her (rightly) of plotting the whole thing to get Bareil out of the way — though Neela later says she acted alone. This sets the stage for Winn to be a manipulative power player and enemy to the Federation going forward. 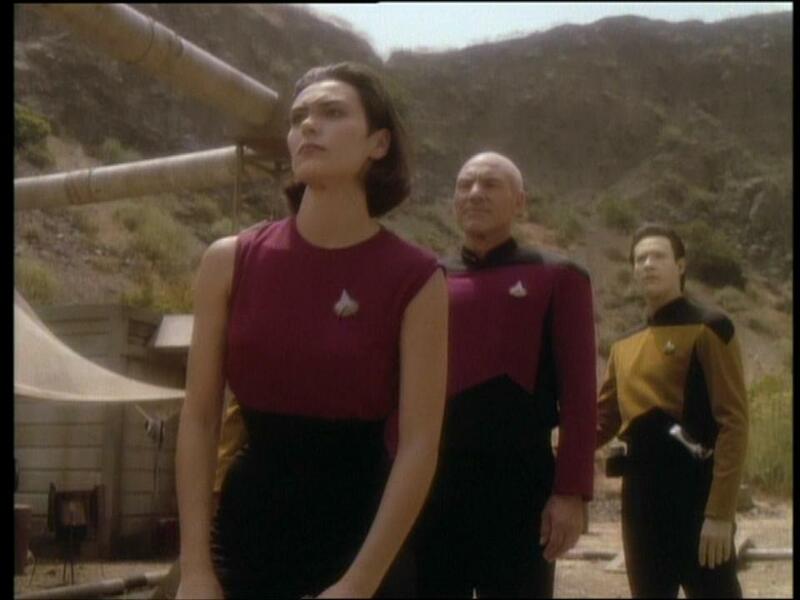 The event also has the effect of pushing Sisko and Kira together after a season of (mostly) acrimony. Winn and Bareil brace for the stunning conclusion to “One Flew Over the Cuckoo’s Nest”. Early DS9 focused much of its time on turmoil involving the Federation and Bajor. This is likely the best example, as it shows the schism between the spiritual Bajorans and the non-spiritual Federation. It also partly explains the factions forming on Bajor that take effect in the three-parter that begins the second season. We won’t review those three episodes — though they are good — because the actions in them really don’t have consequences. The characters and the extremist group behind it never appear again, except for Winn and Bareil, who are introduced here. Winn, of course, is a HUGE character in the DS9 mythos, as we’ll see going forward. So, to a lesser extent, is Bareil. Thematically, this episode shows one of DS9’s strengths — the ability to slowly and gradually depict an evolving situation over several years. The Federation/Bajoran turmoil was personified by Sisko and Kira and the quiet realization that the two of them have at the end of the episode is an important development. Really, Keiko O’Brien is the biggest problem in this episode. It’s hard to imagine that she would be so hard-headed AND oblivious to the fact that her secular teachings could cause problems among a spiritual people. 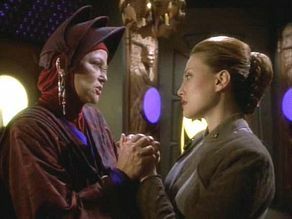 In “Emissary”, we learn that the only thing that binds the Bajoran people together is their religion. Even if Keiko disagreed with Winn, her shock at what happened was an example of poorly done exposition (or bad acting, anyway). The only other problem is that the Bajoran issues seen here as a big damn deal mostly go away in later DS9. 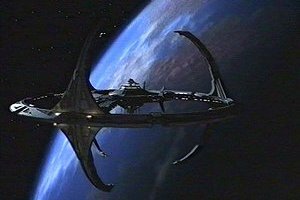 Essentially, the creators pivoted from the Bajoran storylines in season two (when the series wasn’t doing well) and brought in the the Maquis, the Dominion and (later) the Klingons. That probably was a smart idea for the sake of the series — but it’s too bad that we see SO little of the Bajoran turmoil going forward (when so much time is wasted on things like Ferengi nonsense or Lwaxana Troi pining for Odo). Other than Sisko’s role as the Emissary, Winn’s backbiting and the eventual rise to power of Kira’s resistance buddy Shakaar in season three, the Bajorans seem pretty content and in step with the Federation. This is a great episode as far as understanding why DS9 was such a square peg in Trek. This wasn’t the type of outing that any other series would have likely attempted. Where I grew up, DS9 and TNG aired back to back. I can imagine someone wondering what the hell they were seeing while watching “In the Hands of the Prophets” after seeing a TNG episode like “Timescape”, a fairly by-the-numbers sci-fi/Trek outing, which aired around the same time. But “In the Hands of the Prophets” is still a good episode, even if some of the first season issues still show up. It’s the episode that best explains the Bajoran situation after the Cardassian withdrawal.